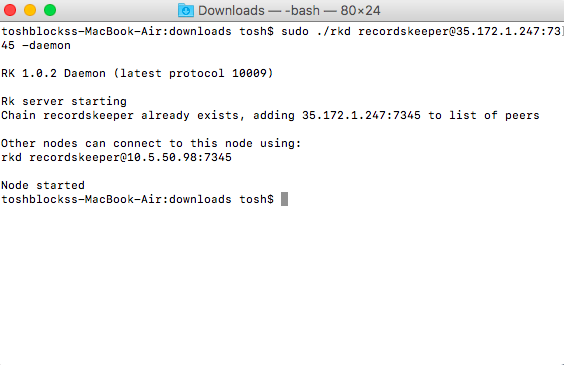 Moving the RecordsKeeper files to the bin directory makes them easily accessible from the command line anywhere. The RecordsKeeper Testnet blockchain is available for users to develop and deploy applications on the RecordsKeeper blockchain. XRK Testnet tokens do not hold any value and are only available for testing. You can earn XRK tokens from RecordsKeeper Mainnet mining. First, kill the daemon process, and then try connecting to the RecordsKeeper blockchain again. If the problem persists, restart your computer and then repeat the whole process of connecting to the RecordsKeeper blockchain again. Your node will sync with the best block, and then your node can start mining and your balance will get updated with the mined XRK tokens.